This step-by-step pictorial reference covers all of the essential techniques for turning wood. Organized for quick access, this book makes it easy to find exactly the technique you are looking for. Over 850 photos and drawings illustrate how to hold, sharpen, and use turning tools, use specialized chucks, deep hollow elegant vessels, finish at the lathe, and much more. 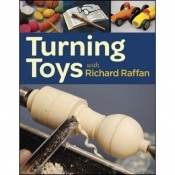 About the author Richard Raffan has been internationally acclaimed for both his turning and his teaching. Well-known for his gallery-quality production work, he is the author of Turning Wood, Turning Projects, Turning Boxes, and Turning Bowls, all from The Taunton Press. He lives in Canberra, Australia. Learn to make beautiful vases and other hollow forms. For thousands of years, and throughout the globe, mankind has created hollow forms to store everyday essentials and things of value. Objects like these, while designed to be functional, can also be beautiful, intricate, imaginative, and decorative. Today, interest in making your own hollow forms is on the rise. 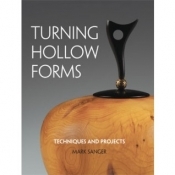 Turning Hollow Forms fills a gap in the contemporary world of “hollow” to show turners of all levels just how to create these works of art. You’ll find in-depth, step-by-step coverage of turning techniques with over 450 clear photos, nearly 50 illustrations, and tons of expert instruction. Ready, Set, Turn! 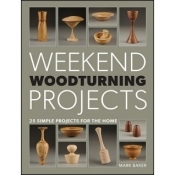 Weekend Woodturning Projects: 25 Simple Projects for the Home is the best way to start your woodturning and woodworking pursuit. This book will build your woodturning skills and your confidence. Ideal for beginner and intermediate turners. This book presents clear, step-by-step instructions accompanied by over 600 photographs and finely detailed drawings (with dimensions for further guidance) – here’s all the hands-on knowledge you'll need to start your woodworking projects. Get a great start in woodturning with expert, shop-tested insights and advice from the American Association of Woodturners. With this collection of articles from American Woodturner magazine, the official journal of the AAW, you’ll quickly get out of the blocks with the best practices on safety, tools, and fundamental techniques. Along with the 18 skill-building projects for everything from bowls and pens to holiday ornaments and doorknobs, Getting Started in Woodturning delivers all the detailed, practical advice a beginner needs. Everything a woodturner needs to know about using and implementing the exciting new technology of replaceable carbide cutting tips is included in this guide. Woodturning tools have taken a quantum leap since the recent introduction of these tips that have greatly simplified the task of turning in dry stock. Carbide-tipped woodturning tools are safer, faster, easier, and more efficient than traditional tools that require grinding the end of a piece of fluted steel to one of dozens of subjective profiles. The technology of the carbide cutters is fully explained, as are the various shafts and the function of the handle designs, providing insight into how and why these cutters act as they do, and why they are shaped as they are. Removing the intimidating aspects of turning, the guide explains the elimination of sharpening, addresses the issues of chatter and fatigue, and advises on maintenance, techniques, and usage. A number of projects are included—such as a candlestick, spinning tops, and a basic bowl—that can be completed right away by novice turners, rather than waiting for years to gain enough experience to do the same job with traditional tools. Perfect for turners and crafters of all abilities. The Complete Guide to Turning Pens & Pencils lives up to its name. Heres everything you need, even if youre just starting out, to craft your own custom-made writing instruments. 15 enticing projects. Build your turning skills as you work your way through these gorgeous projects that range from beginner to advanced. Master the sanding, polishing, and finishing techniques to craft pens and pencils from scratch or using blanks. Learn to work with wood, acrylics, or polymer clay and how to choose the right mechanisms. Minimum investment for maximum enjoyment. The beauty of these projects is that you can turn out beautiful work using little more than a standing or even a portable lathe. And, even the most time-starved crafters can fit these projects into a busy schedule. Inspiration and instruction from a pro. Author Walter Hall, an accomplished wood turner in the U.K., shares a wealth of ideas and trade secrets in this complete guide. Springboard off of his experience to create your own works of art. The lathe used to be a utilitarian tool only, but in the hands of todays artists woodturning has undergone a beautiful transformation. This stunning international collection showcases the work of 40 pioneering woodturners who have expanded the possibilities of the medium. Their pieces range from classic to humorous to sculptural to amazing. Curator Jim Christiansen introduces each masters multi-page gallery with an insightful overview, and the creators themselves offer their lyrical thoughts on wood, nature, and art. Jim Christiansens creations have been featured in magazines and books such as American Woodturner and Wood Art Today. He has exhibited nationally and internationally and curated a number of regional shows and several major exhibitions, including Woodturning On The Edge in 2006, which featured groundbreaking work by leading turners. In the New Masters of Woodturning youll meet thirty-one contemporary artists from around the world, who have created a wealth of stylistic approaches, innovative techniques, and distinctive philosophies of woodturning. Their stunning works push the boundaries of the craft and art, as well as evoke their personal motivations, thought process and groundbreaking techniques. With more than 25 pen projects, using the latest hardware kits on the market, The Pen Turners Bible takes the reader from simple ballpoint pen designs on a wood lathe, to complex fountain pen designs on a metal lathe. Pen artist Richard Kleinhenz shares with the reader his unmatched expertise in pen making. From material selection to final finish and each important step between, The Pen Turners Bible teaches every aspect of the pen-making craft. The Pen Turners Bible is a unique skill-building book that teaches readers how to build and master their own woodworking tools while creating beautiful and useful pens. By tackling these pen-making projects, the reader will quickly develop his or her woodworking skills to a highly advanced level.Beginning with a simple, yet very elegant, ballpoint pen, the steps in the creation of a pen are explained in detail. Subsequent chapters and projects add more complexity, techniques, and tools, teaching readers to progress from basic pen-turning kits to developing their own free designs.These pen-turning projects will also develop the readers skills with using and building tools. The Pen Turners Bible discusses spiraling jigs past and present, and demonstrates their use on five pens with detailed instructions. A spiral jig allows you how to make the popular rope design, spiral grooved, as well as straight fluted or faceted pens. The metal lathe can do just about everything a wood lathe can, and it can also support a wood lathe with tooling made on it plus allow thread cutting and other operations not easily done on a wood lathe. Kleinhenz also presents his own original designs for unique tools and jigs that the reader can make at home  tools that are as good or better than commercial tools. Throughout The Pen Turners Bible, the reader is given more than just a step-by-step process to follow. The author always provides a broader perspective to stimulate creativity so that readers are encouraged to take the techniques beyond the specific instructions, use their imaginations, and make the art their own.Audience: Woodworking home hobbyists. Dedicated to providing integral information about woodworking tools and techniques that other manuals overlook, the books in this series contain safety facts, explanations about basic project setup, and tips for maximizing tool performance. Filled with clear diagrams and instructions, these pocket-sized, durable manuals are ideal for quick reference in the workshop. The maintenance and uses of lathes are explored in this highly specialized yet accessible handbook. It covers all aspects of lathe ownership, from initial setup to the most efficient uses. Filled with information germane to all woodworkers, this guide effectively explains the ins and outs of lathe operation without being bogged down by unnecessary sample projects. This no-nonsense manual focuses on user-friendly solutions and instructions on lathe usage. Where does a design idea come from? And what does it take to bring it to life? This invaluable design reference for new and advanced woodturners alike answers these questions and more. 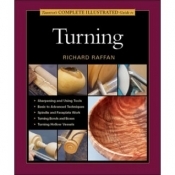 In Woodturning Design, author Derek Hayes takes turners step-by-step through the process of design, beginning with basic principles and then moving into proportion, pattern, and form. He also addresses working with different woods, color, and decoration. Hundreds of instructional photographs and illustrations will assist readers at every turn. Although many crafters can follow clearly illustrated instructions to achieve a desired result, they struggle with adapting the design to become uniquely their own. This practical yet inspirational book will motivate turners to take what they learn here and transform wood in new and different ways. Two expert wood turners, Nick Agar and David Springett, have developed a radical new way to use narrow strips of wood (usually of little use to wood turners) to produce curvy, graceful, asymmetrical vessels. They offer their innovative methods and stunning designs to the home woodworker in 14 unique projects, complete with guidance on tools, techniques, and materials.